Our 20+year experience with implementing succesfull pricing policies is that it's extremely important to do the right things right - at the right moment. Companies need to have a pricing maturity roadmap to improve. They need to set the right priorities in their pricing projects. PS : We strongly recommend your pricing teams to invest in a "Certified Pricing Manager" Programme to support the process. The CPM programme is recognised as the leading pricing programme, with certification based on a real business project with proven successes. A study by the EPP (European Pricing Platform) revealed that still many organisations can improve when it comes to value capturing (pricing). In many organisations, pricing is still under-leveraged opportunity for substantial margin improvement. And we all know that a small improvement in price realisation - or tackling the most obvious price and margin leakages in your product and customer portfolio - have an important impact on your bottom line result. 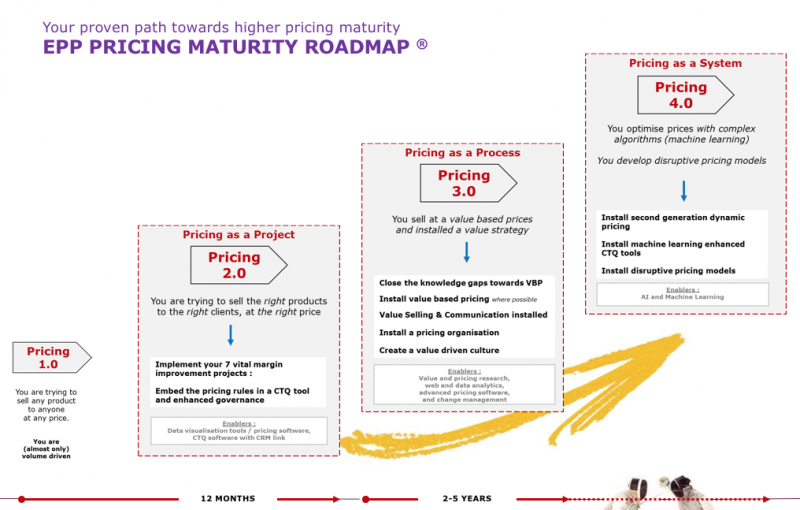 But still many organisations struggle to define a clear roadmap to develop their pricing maturity. 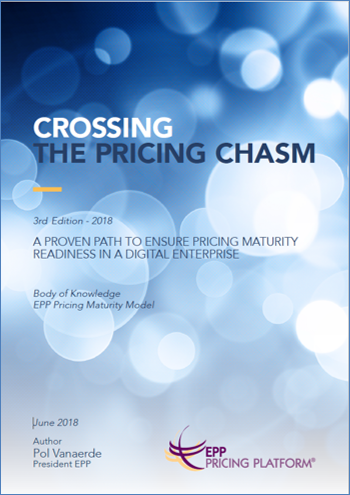 Read our whitepaper 'Crossing the pricing chasm' for a bleuprint of pricing maturity roadmapping. Our team helps you to assess your actual pricing maturity and defines with you a practical roadmap for the next 12 to 24 months to excel your pricing teams. Make professional development a continuous part of your pricing management team. Make it a priority to learn and improve the skill set. During the pricing training, we will bring you successful pricing experts, sharing their knowledge and best practices to support your pricing maturity development. All our open pricing trainings can also be organised as an in-company training, or completely tailor-made to the specific needs and desired outcomes of you and your team. VC helps to accelerate the implementation of your pricing software ; pricing software, inclusive dynamic pricing platforms. We know how challenging the implementation can be, our consultants have been there, many times. We know the pittfals and help to avoid you them. Dynamic pricing creates a specific challenge : implementing the dynamic pricing platfrom is one thing, managing dynamic pricing is another thing. Dynamic pricing is dynamic by nature, it requires solid teams to manage it, we support, coach, help. Price scraping software can add substantial insights in price elasticy, competitive go to market policy, channel adherence to your price policy, channel out-of-stocks etc. Transforming the data into actional insights requires a cross-functional approach between pricing, marketing and data-analytics teams. We support implementation and creation of actionable insights.